Cool. Well...it's nice to know I'm right at least once a year! The downside to that is it's kind of a one-off home-grown mod so, it'll take some digging to find a 4-string True Gold firstly, but then you'd have to find another 4-string stealth model and marry their parts together. Or possibly find a shop that can convert the nickle-silver finish to matte black. Anyway...all the best in your search. Thanks man! I haven't found a single True gold 4H yet. I'll keep looking though! One day! Calgary eh? Banff is my dreamplace to live! Another "One Day" there too, but if you ever see a guy playing a True Gold 4H with stealth hardware in your neck of the woods, say hi, hopefully it will be me. Need any pics of Orange Firemist? I have a 2009 BFR Bongo in Orange Firemist. I believe it is different then Lava Pearl or Tangerine Pearl. I have some decent pictures of you want/need them to catalog that color. Is there any way of knowing which year&rsquo;s certain colours were offered? I have a translucent purple stingray I bought new in 2001 and a trans teal I picked up second hand this year which was listed as 2005 but I&rsquo;m keen to know the years during which those colours were offered. I&rsquo;ve posted for the info on the serial numbers thread but is there a list of each colour and the years it was offered anywhere? Thank you! Sometimes there are threads about new and discontinued colours. There's a search button at the top of the page. EB catalogues are also useful. Trans Teal: circa 1985 to 2009. Trans Purple: circa 2000 to 2001. Rare. I have a note from an old thread where less than 50 Sting Rays were finished in this colour. Actually, that count I responded to nrbassplayer above was only for StingRays - it did not count StingRay 5's. I would need to do some research to see how many SR5's were made in Trans "Mary Kay" White. There were less than 35 production pieces made in the Trans White "Mary Kay White" - all of them were made in 1993-94. Less than 10 of those were like yours - 3-band EQ with a rosewood fretboard. My original tortoise pickguard did the same, the upper layer lifted where the PG meets the fretboard. Maybe there was an issue with that particular batch? That is transparent white "Mary Kay White". 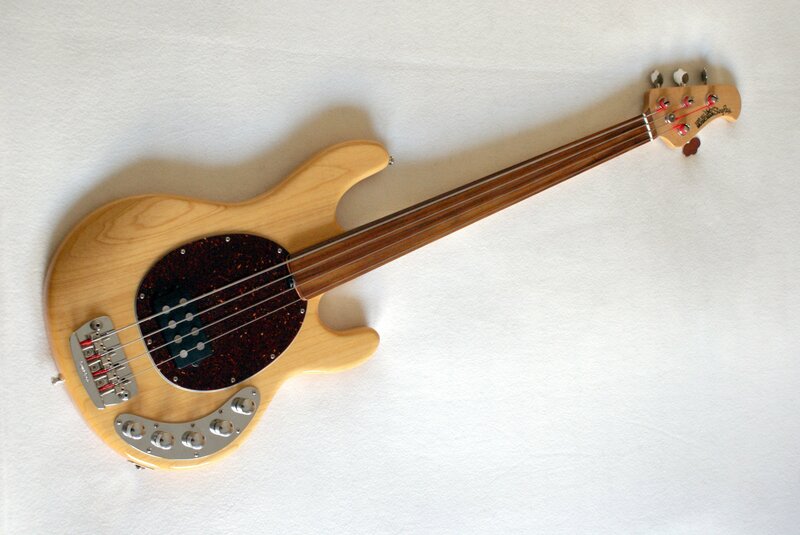 I had one just like it (sold it with a non-original pickguard just like that one). Maybe it is the same one as they only made less than 10 in that configuration and less than 35 production pieces. They have since had other production runs with transparent white, but the originals are rare. I bought this one in Denver 1997, just got the manufacturing date on the other thread, made in 1994. Never saw any other bass in this color, and then it popped up on me the other week on this forum! Glad it is a rare one! Fantastic bass! Last edited by petersamuelsson; 06-17-2018 at 05:51 AM. Paul, thats a bad pic. My local store had a FER. Think Crayola crayon color red-orange. Looked really great in person, but one of only 3 Ive seen in that finish. Doing some checking around the serial number thread, I'm guessing this is actually a 2004-2005 "Graphite Pearl" with "Black Ice" pickguard. Last edited by amper; 10-28-2018 at 03:24 PM. Last edited by Paco Maraca; 03-15-2019 at 03:09 PM. What do you think the odds are that we can get some counts.? Maybe set up a poll to get us moving in the right direction.